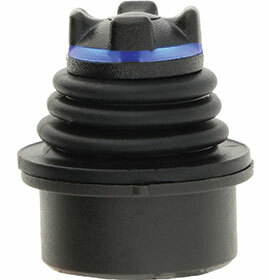 Apem is expanding its TS series thumbstick range to include an LED backlighting option. The TS series is a miniature joystick featuring contactless Hall effect technology to provide long-life proportional control. With a total current draw no greater than 16 mA, the new LED thumbstick option is ideally suited for wireless remote control applications where visibility is low and battery life and power consumption are critical. The new backlighting option utilises an overmoulded polycarbonate ‘castle’ style actuator to effectively diffuse the LED and provide illumination over a wide viewing angle. Both red and blue colour options are available.